This is Linda, in my back yard in the summer of 1968. Linda was an inner-city child who had signed up to spend a week during the summer on a farm, probably as part of Lyndon Johnson’s Pilot City projects. Well, the program ran out of farms. So somehow they found our names and asked us, although we didn’t live in the country but only in the suburbs, whether we would be willing to take one of the left-out children and of course we said yes. We were practically newlyweds then, with no children of our own yet, although Mark was on his way. 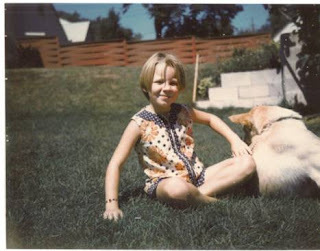 Linda was ten years old and one of 10 children of an impoverished family, and she was perhaps the least spoiled child I have ever met, and one of the most delightful. Her first day with us, I asked her what was her usual bedtime, and she said, “Oh, right around midnight or so.” So we said fine; that was our bedtime, too. It was about 9:30 when she began yawning, and glancing at a clock, exclaimed, “Golly, look how late it is!” So, with a smile, I told her it was okay, she didn’t HAVE to stay up until midnight if she didn’t want to. After that, she was usually in bed by eight. We took her to a pow-wow on Saturday night. Where we lived, in Minneapolis, there were many Native Americans, and my then husband was doing social work among them, so we were always invited. I don’t remember exactly what we said, only how we cringed as we explained that these were our good friends. Thus emboldened, she went straight up to the drummers and wanted to bang on their drums. They of course didn’t give her that opportunity, but she did pick up the chant and began singing that with them until we stopped her: “HI –ya–ya–ya,” something like that. She also wanted to join the dance circle, but we explained that white people couldn’t unless invited, and we weren’t going to be invited because we weren’t in native dress. That was a Saturday night, and we were worried about Sunday afternoon, because the Little People (dwarves and midgets) had invited us to their picnic. There was a man in Jericho called Zacchaeus. Yet the Lord loved Zacchaeus, better than them all. And the people began to gather from miles around. And the Lord looked up and said, "Zacchaeus, come down." 2. The Lord said, "Zacchaeus, I am dining with you today. Zacchaeus, I come to your house, come lead the way." "This man is a sinner, does the Lord seek lodging here?" That a man who is stout of heart can grow and grow. And salvation came that day to his whole household. We took her to the Little People’s picnic and she just fitted right in, never hesitating to play with the other children and having a ball. She never embarrassed us once. This photo is the only keepsake I have of Linda. She must be in her fifties now, and I wish there were some way to find out how her life has been. I hope she remained as charming an adult as she was a ten-year-old. How very sweet of you to take her in for the summer...and sounds like her pure nature was something you'll never forget! Great photo. what a special kid; sounds like she had some nice times... one of ten; God bless her! I'm really enjoying your photos and memories! "Who are You to Tell me How to Live my Life?" Now Here's Creativity for You! St. Peter Relics for Sale!